British businessman and racing driver Captain Raymond Flower had the idea of producing a small car while living in Egypt. Back in Britain during the Suez crisis, he collaborated with Henry Meadows Limited of Wolverhampton, a well-known engine builder. The new car was to be known as the "Frisky". Captain Flower's original design was not used and the body was restyled as a gullwing by Alfredo Vignale and Co of Turin and shipped direct from there to the 1957 Geneva Motor Show. The Gullwing never went into production. Judged as impractical for production, the Frisky was once again restyled with open bodywork and conventional doors. The first production model was known as the "Frisky Sport"
The 324cc Villiers engine ran backwards for reverse, à la Messerschmitt, and the front suspension was Dubonnet-type independent. Sold both as a coupe and a convertible the Frisky Sport was able to touch 65 mph. The name was appropriate for its lively performance and delightful styling. 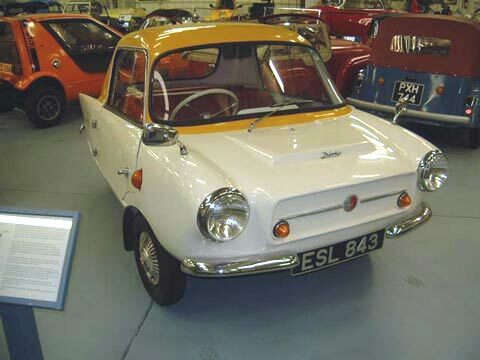 In 1958, the company became Frisky Cars Ltd and a new Sports car called the 'Sprint' was developed but never put into production due to high manufacturing costs. 1959 saw the introduction of the 'Family Three' which had lower production costs and tax savings for the customer due to the three-wheel configuration. The later "MK 2" version of the car (introduced in 1960) was stretched by 18 cm in order to fit a larger motor and to accommodate two very small seats behind the front bench seat. This was an option which was advertised for the "extended" Mark2 but there was still no room for even a very small child to use them (unless you cut their legs off!) very few were fitted! The following model, called the Prince was created but the graceful Michelotti lines were lost in the coarse, clumsy factory restyle as a heavy-pillared coupe. Production problems soon brought Frisky manufacture to an end after a total of approximately 1500 Friskys of all models built. Eventually, Meadows abandoned production in 1964. Weight: 6.5 cwt Electrics: 12 v 3 Wheels: 4.40 x 10"